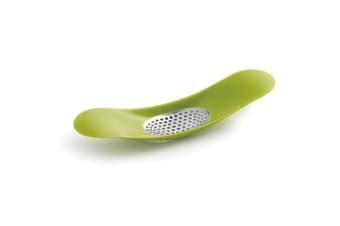 The Joseph Joseph Rocker Garlic Crusher (Green) makes crushing garlic simpler! It lets you use downward pressure and a ‘rocking’ motion to crush garlic cloves quickly and efficiently. The crushed pieces are then held in the curved design, allowing them to be spooned or scraped conveniently into a pan or bowl.